A leading Korean pianist and pedagogue, he won first prize in the 1985 Robert Casadesus (now Cleveland) International Piano Competition. Since his New York debut in 1986, when he received a favorable review in the New York Times, he has appeared in major cities throughout the United States, Europe and Asia. His recent discography includes Mozart Piano Concertos K488 and K453, conducting the Polish National Radio Symphony Orchestra from the keyboard. He received Professor of the Year Award from the Music Association of Korea in 2006, and was recently nominated Artist of the Year by the Korean Ministry of Culture. Professor Kim has been on the jury of competitions such as the Busoni; the Gina Bachauer; Clara Haskil; Beethoven, Bonn; Cleveland; Hamamatsu; Paderewski; Leeds; and Queen Elisabeth International. His students have won first prizes in the Clara Haskil and Leeds Competitions. Daejin Kim received a Bachelor’s, Master’s, and Doctorate from the Juilliard where he studied with Martin Canin. 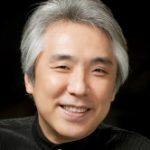 He was associate faculty member at the Manhattan School of Music and is currently Professor of Piano at the Korean National University of Arts and Music Director of the Kumho Chamber Music Society. In 2008 he became Music Director of the Suwon Philharmonic Orchestra.